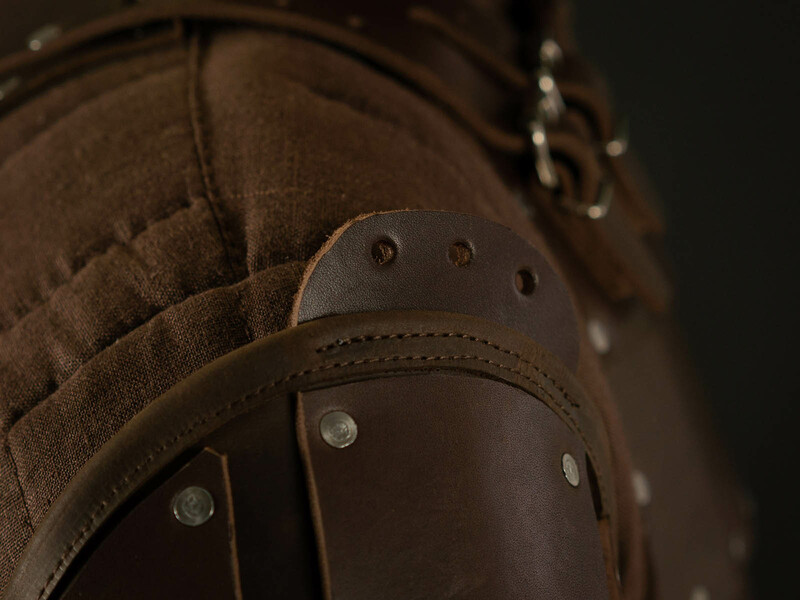 When we are talking about perfect medieval leather armor of the XIV century, it is hard to give decisive answer. What to choose? 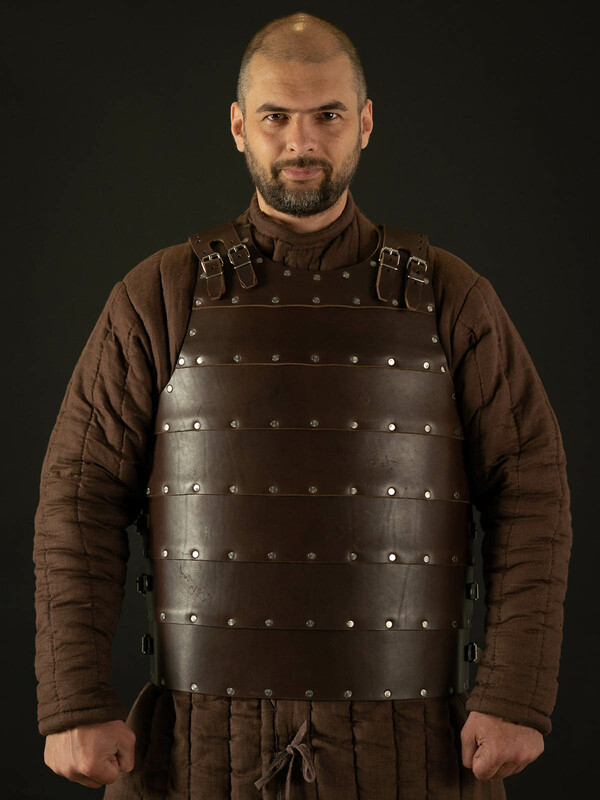 Simplicity, robustness and inelegant charm of Visby brigandine or specific elegance, progressiveness and “almost-cuirass” shape of its colleague from Chalkis. All these retro-horizontal strips of Visby brigandine are so beautiful, but it is quite impossible to fasten it on its own! 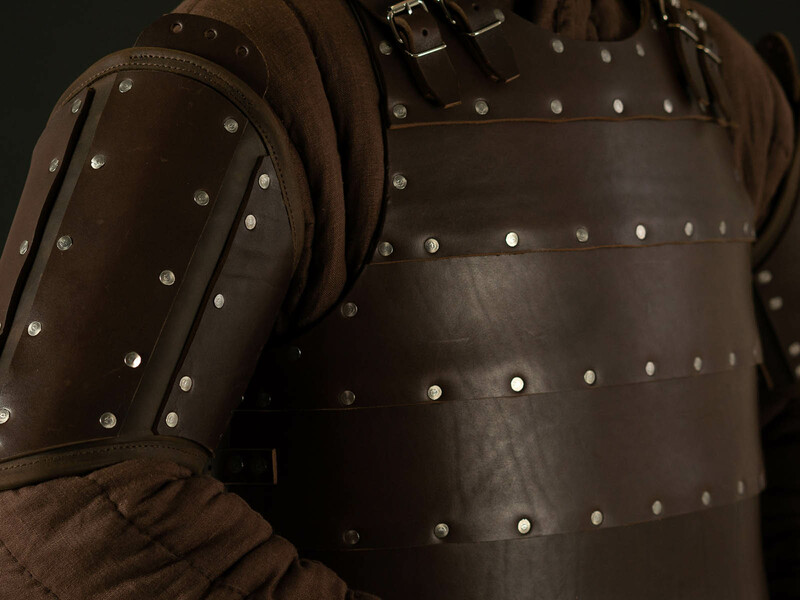 However, knight leather armor from Chalkis is much more functional, but noble Don is not in mood for “almost-cuirass” and fastenings from the front… So, how to choose between Sweden Gotland and Greek Euboea, where were founded above-mentioned leather plate armor? Though, should we make such a choice? If romanticism of the Middle Ages calls for you and freedom-loving spirit feels cramped in the strict frames of the historical reenactment, so there is a solution. 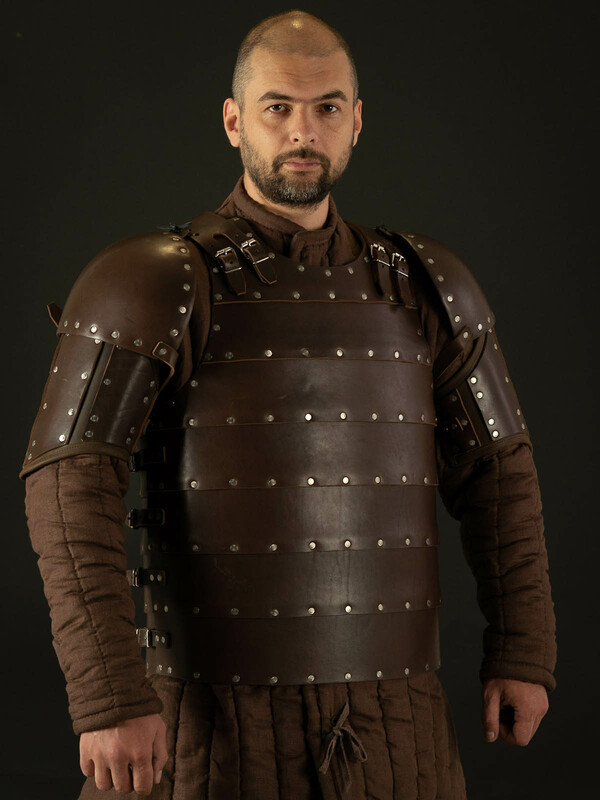 For all people, who are interested at combining of two brigandines, you may get comfortable, hardwearing, robust and custom modern handmade leather armor in style of the XIV century for any event, which is not strict reenactment. 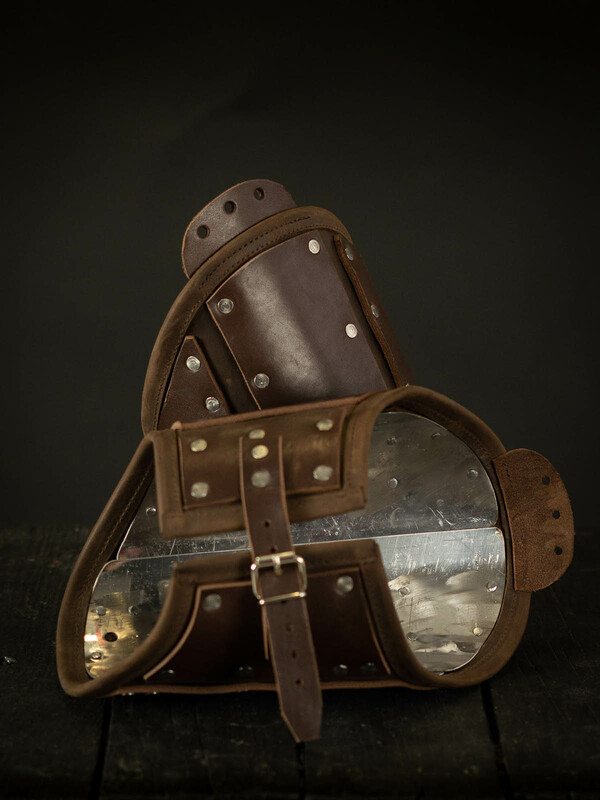 This brigandine will take the best from its historical inspirers and tireless blacksmiths of Steel Mastery creates this leather brigandine kit in style of the 14th century especially for you. 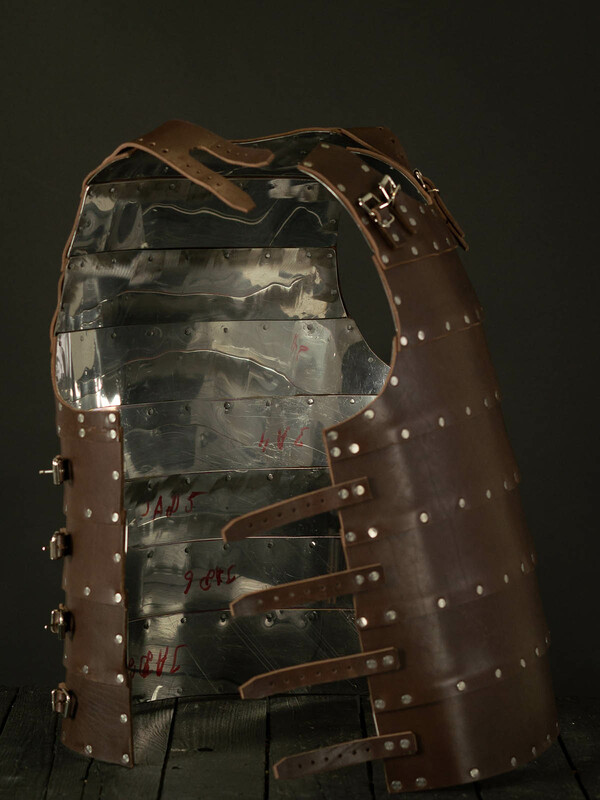 As you understand, body of fighter is protected with leather plate armor, which took the best from the famous brigandines of Visby and Chalkis. These flawlessly reliable steel strips are covered with firm leather. 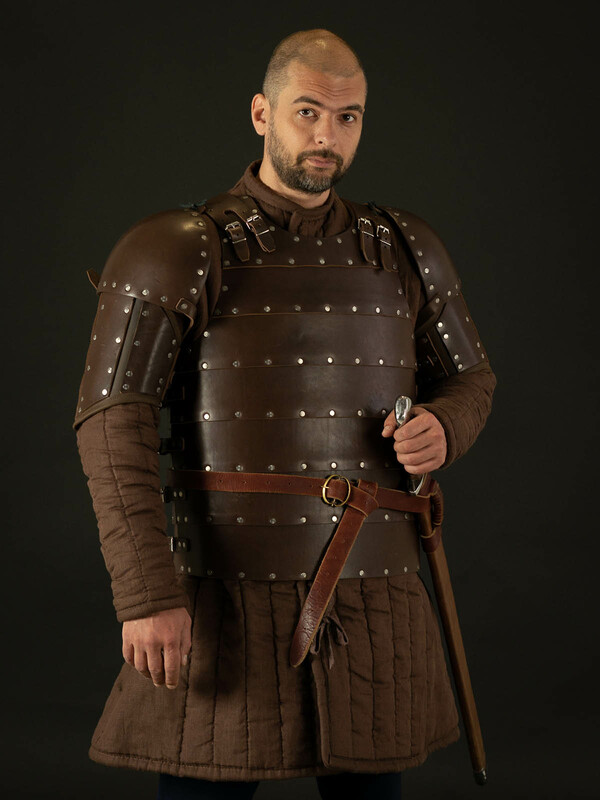 Such brigandine will dare rust, it doesn’t’ glint in the sun, showing you to the enemy, but it looks respectable and impressively. 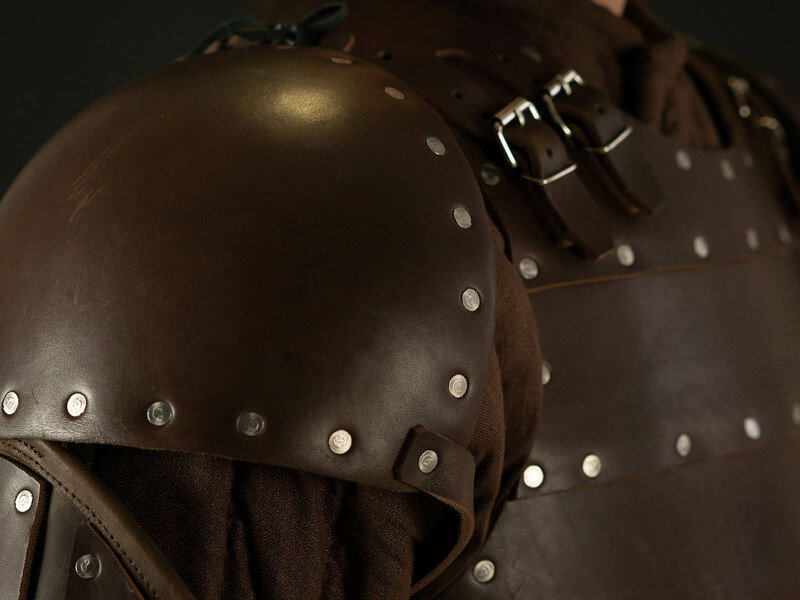 Design of breastplate allows easy fitting of brigandine’s size, depending on the thickness of your padded underarmor. 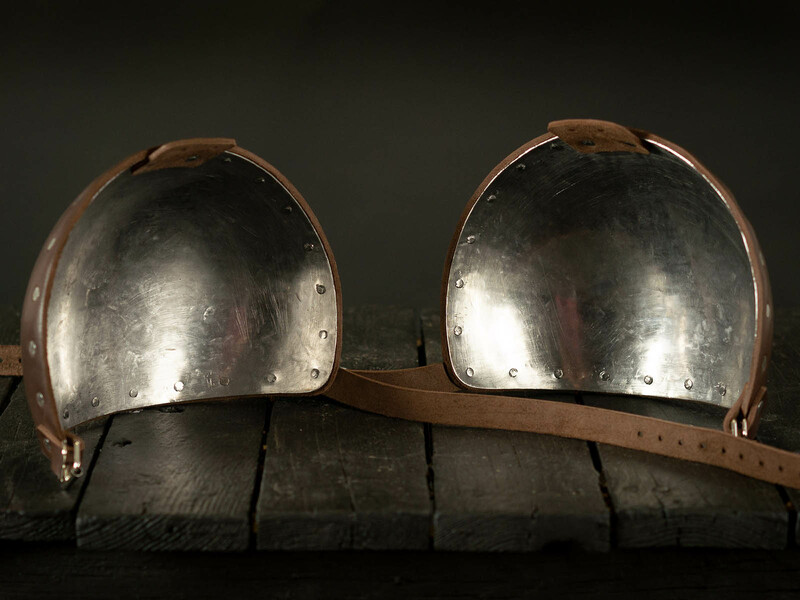 Shoulders are protected with the whole-hammered spaulder, which are covered with leather as well. Under them, there is super-reliable arm protection from the shoulder to the elbow. Two layers of the firmest leather and metal strips will protect your bones of any stroke. 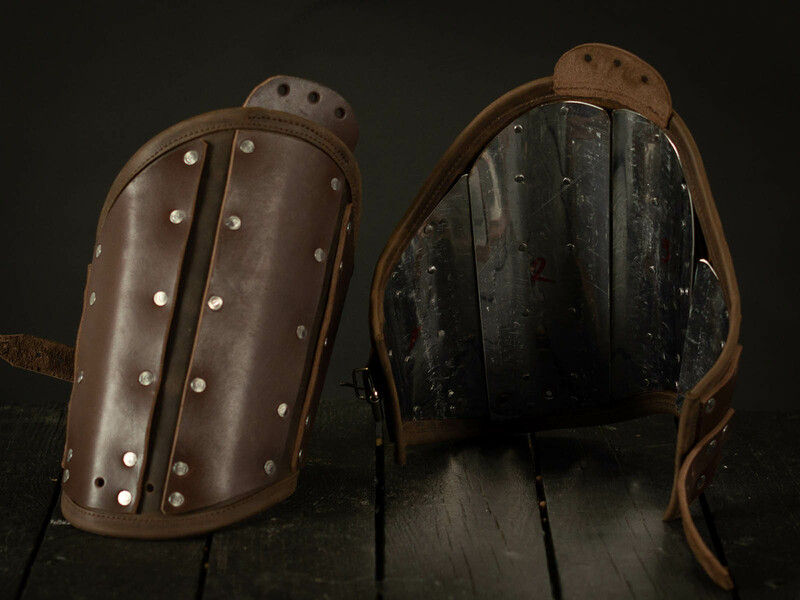 Protection of the forearm is no worse – similar bracers of metal and leather. 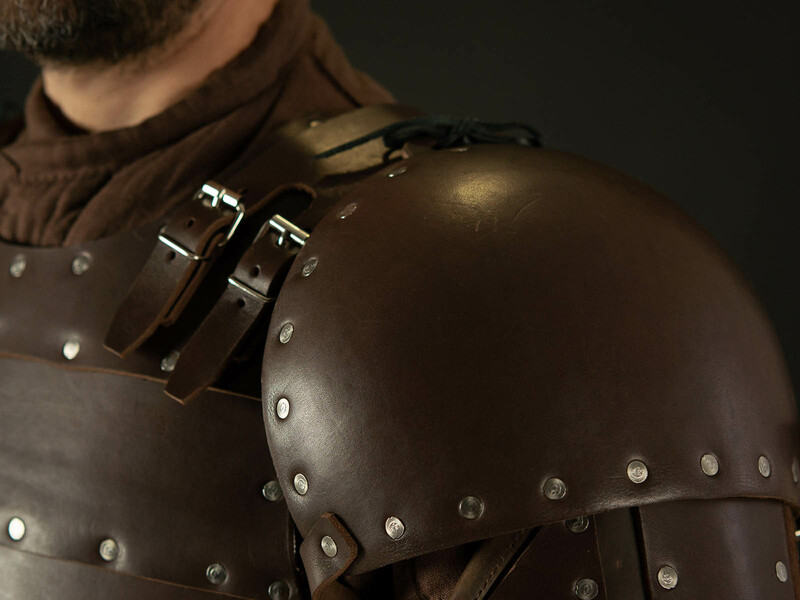 Functional leather armor does not hinder your movements and guarantees your arms perfectly safe. 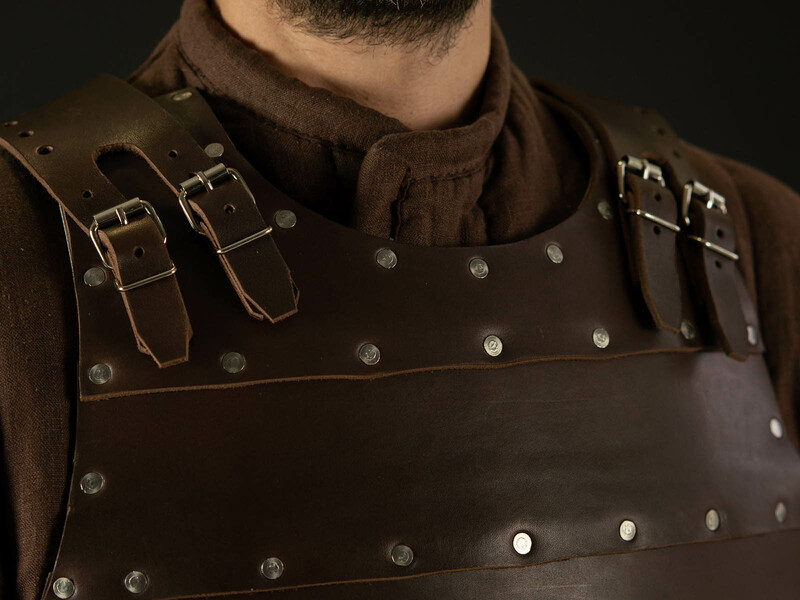 Generally, this handmade leather armor will be premier choice for calm and self-assured warrior – comfortable and functional. 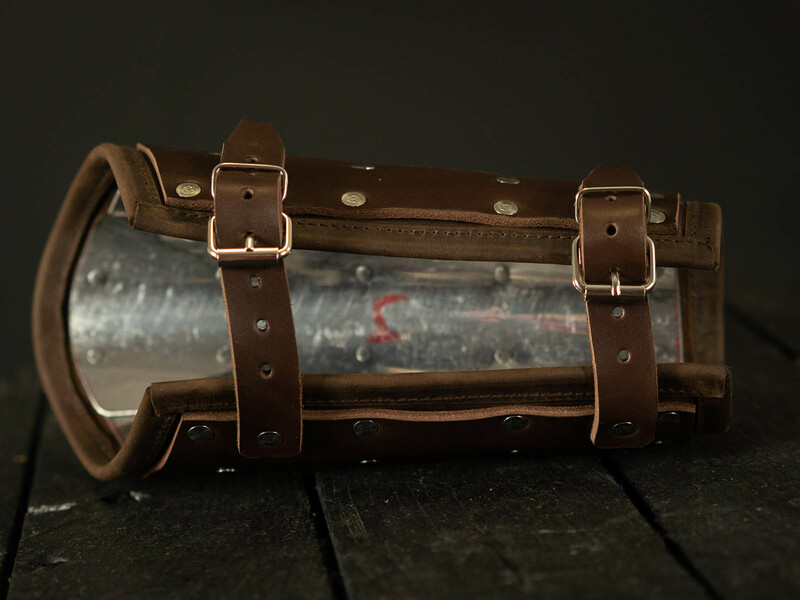 It does not chase after fancy shine, but guarantees good protection; it is plain and robust, as it’s a real leather armor. Of course, you may choose leather color, type and metal of buckles and rivets by your wish. As it is you who will wear this armor. There are simple rivets and burrs, diameter of head is 1.0 cm. Good for light fights (using plastic or wooden weapon), LARP or stage fights. Finding buckle, not historically authentic. Handy and practicable, take a blow well. Historically correct buckle. Handy and practicable, take a blow well. Set consist of 6 small buckles for body part (for belt of width 18 mm) and 2 big buckles (for belt of width 30 mm). Milan-style full-plate armor is well-known as "Avant Armour" and is dated about 1450-1485 years. It was crafted in Corio workshop, Milano, and was belong to Fon Matsch, the owner of Churburg Castle in 1450. Now this full medieval armor is in almost perfect condition and is shown in Kelvingrove Art Gallery and Museum, Glazgo, Scotland. 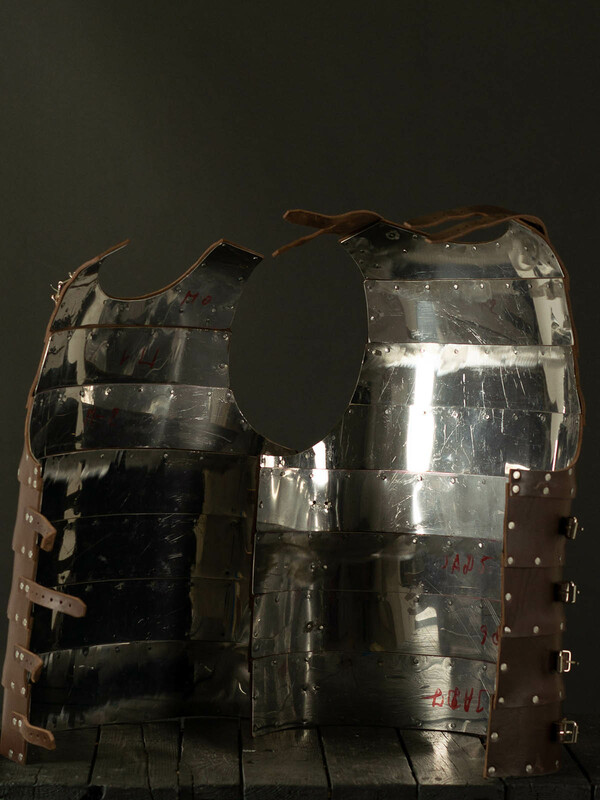 You can use this medieval suit of armor for: SCA HEMA Larp Stage performances Medieval festivals Reenactment events The main features of this steel armour are roundish cuirass with skirt and tassets and the wide different-sized pauldrons. For better protection, a couter can be fixed to the left arm plate. With this Italian armor you may use the closed helmet Armet - the same helmet was a part of classic "Avant Armour". 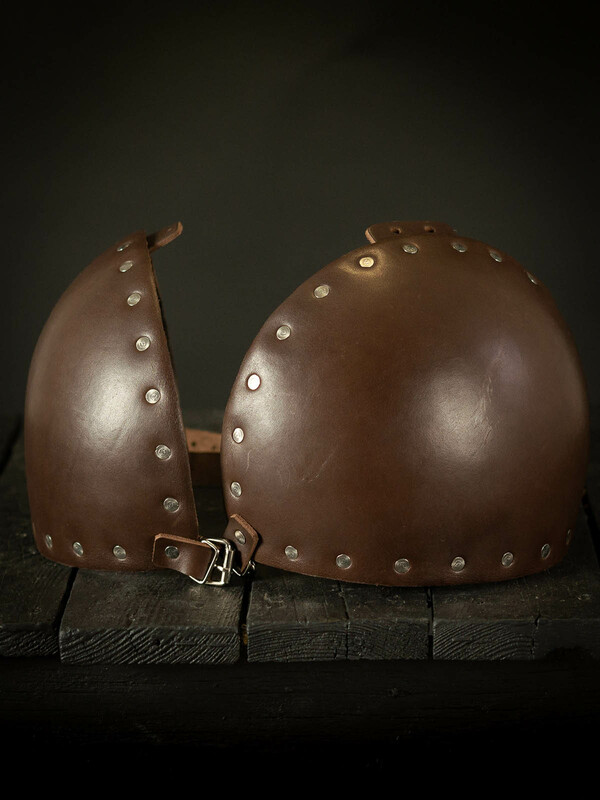 Or, you can choose Barbute helm - this helm is a part of combat armor that is shown in Glazgo museum. 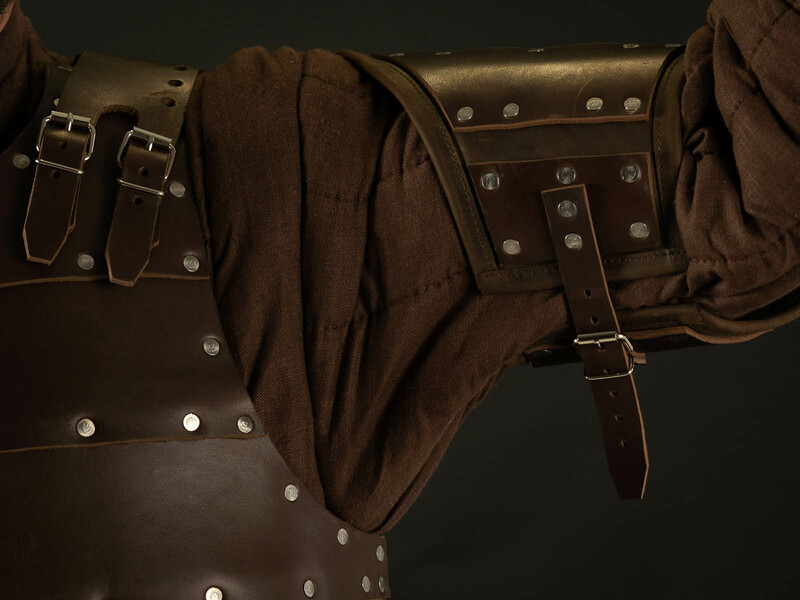 This made-to-measure Milanese armor is completely handcrafted by our artisans. 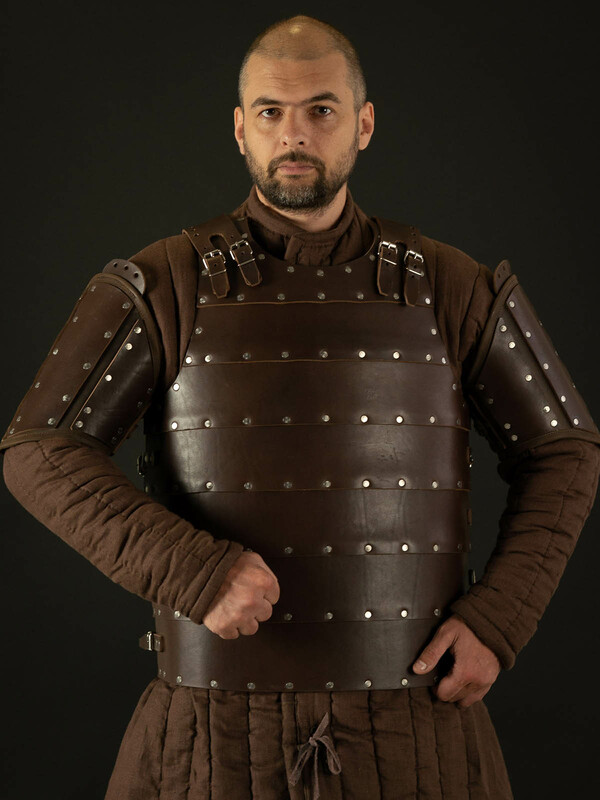 Authentic medieval armor includes the next parts: Helmet “Barbute”;..
Armor of Umbar merchant or our work is a hard work Do you know night of Umbar? No! Definitely, you don’t know it! Play of the waves, whispers in tree crowns, songs from the nearabout taverns, cheeps of rats on scrapheaps and deafly heard rustle of steps. Steps, which are soft as a whisper and fatal as a death. There is an Umbar merchant walked out for a business. Narrow specialist, crackerjack, master of knife and axe, dreamer of the big road. Job of Umbar merchant is hard and risky work, especially when one works all day long. So, it is really frustrating, when an armor is botched. Thus, experienced merchant always turns to Steel Mastery for an armor. We make light, firm and reliable armor for a good price. Men of business understand that and cooperate with us. 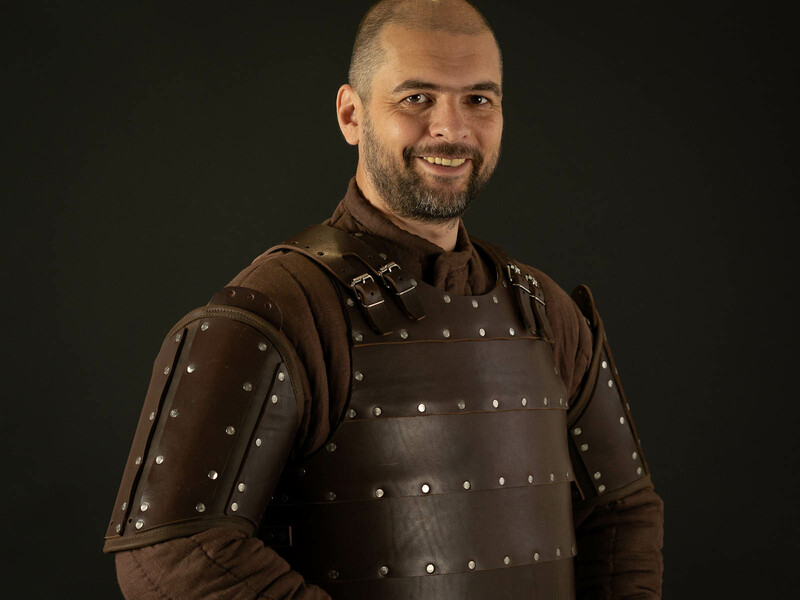 This nice man of business worn brigandine and tassets over the simple and top-quality costume (purchased from us too, by the way! So don’t be shy, order it now :) But Holy God, what an armor it is! It is pure poetry! If Ainur was creating the Universe with a song,..
Set of leather armour is handcrafted in style of fantasy series "Game of Thrones". We use only high-quality natural leather for manufacture. Plates are riveted to the leather base of contrast colour. 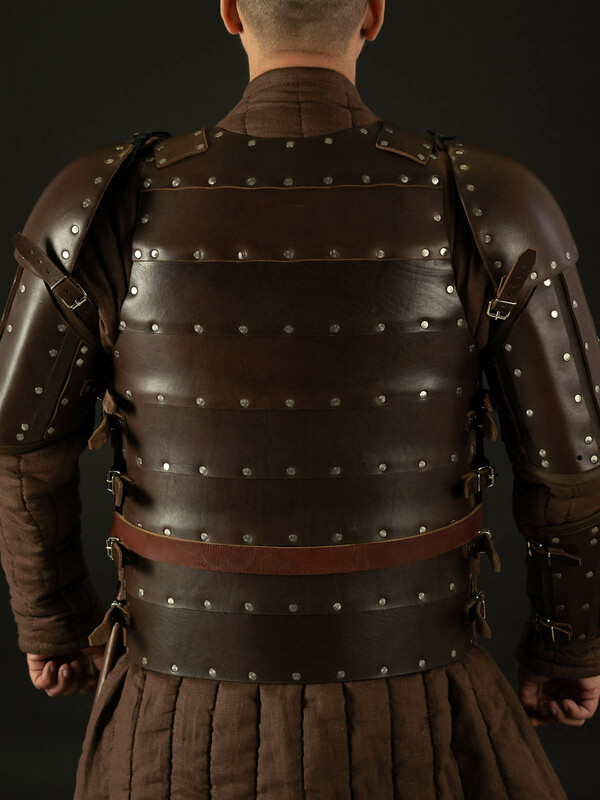 Set consists of the following elements: - cuirass; - thigh and groin protection; - spaulders; - bracers; - greaves Every part of armour is supplied with firm leather belts with buckles. 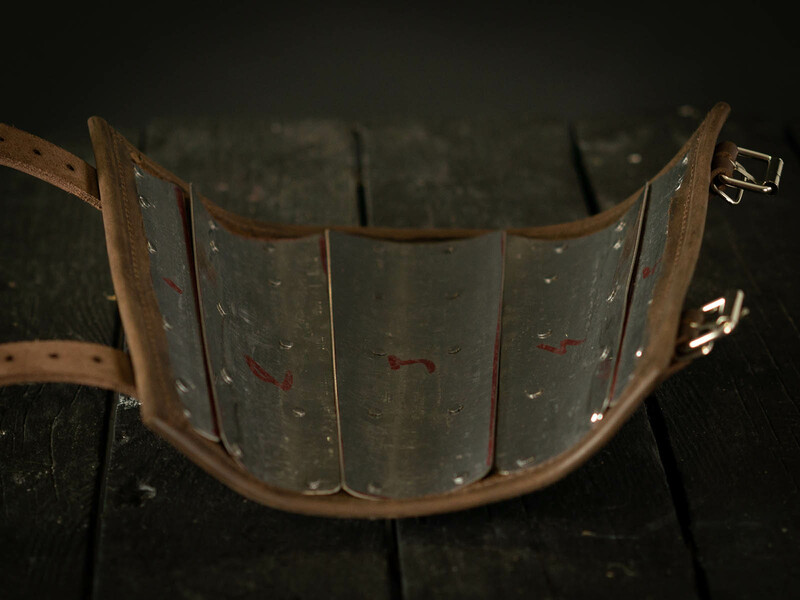 You may fit your armament comfortably on you body by useing these belts. 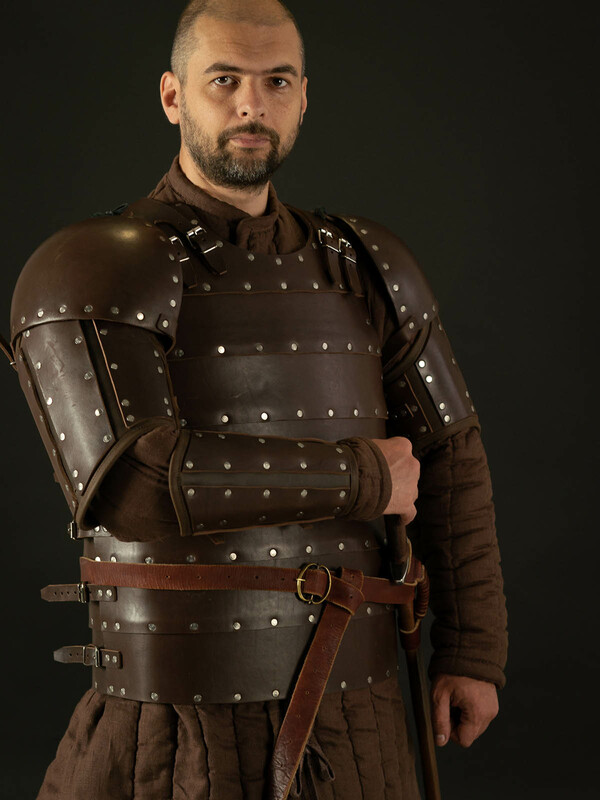 This light and beautiful armour is available for order is in different sizes and in such colours: black, wine-red, brown and hazel (light brown). And below you will wind some funny backstory to creation of this armor. Enjoy! Boobes and dragons forever! 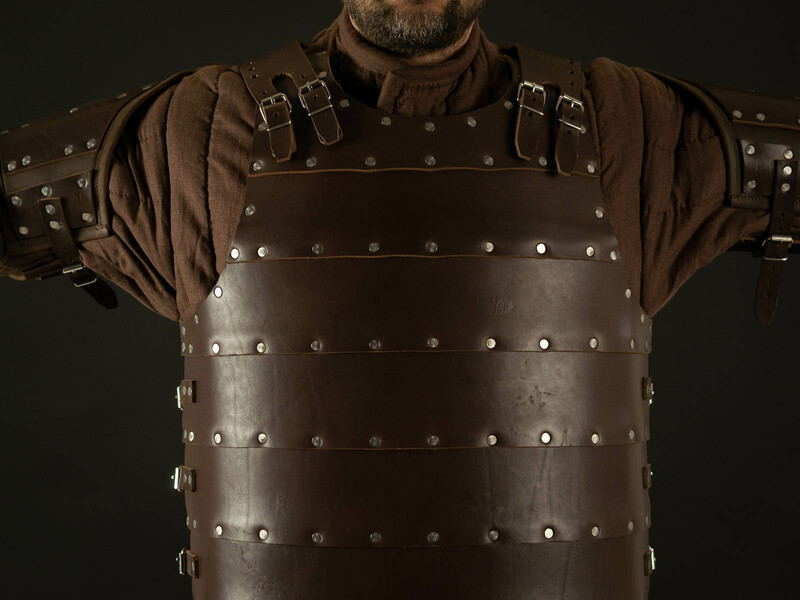 Armor of foot-soldier from House Lannister or AVE Leones Who does always pay their debts? Lannisters! Who does have the most attractive twins? Lannisters! Who does have the smallest dwarves? Lannisters! Whose roar cannot fail to be heard? Lannisters’! Whose mines ar..
“My armor is like tenfold shields, my teeth are swords, my claws spears, the shock of my tail a thunderbolt, my wings a hurricane, and my breath death!” said Smaug the Golden to one hobbit one day. It’s quite hard to debate with a dragon, so we will just add: our bracers are dragon scale. Without false modesty. 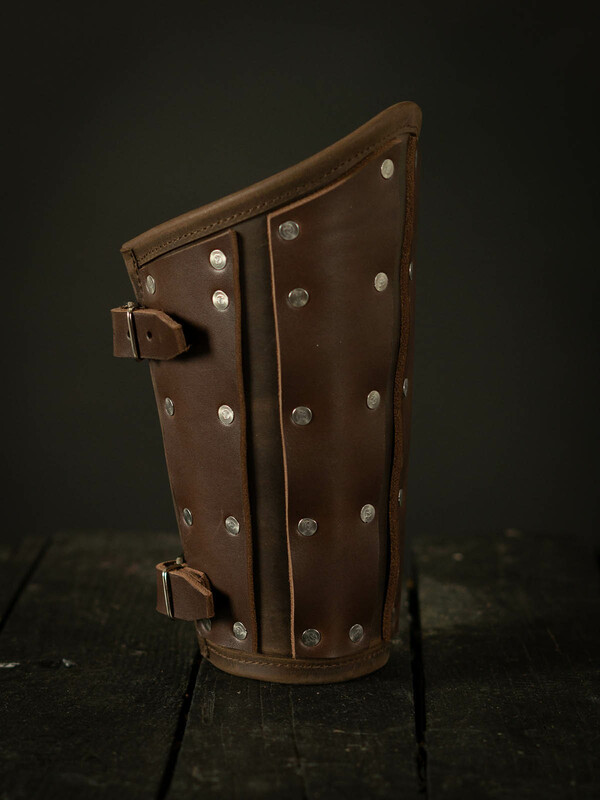 Just look at these leather bracers. In the dark, a shivery one will decide that you are evolving into dragon and your arms are becoming dragon paws. Its tannage is as the most firm shield, its buckles are harder than rock, its belts are stronger than steel, its look is more beautiful than steel shining, its’ owner is as cool as it gets. 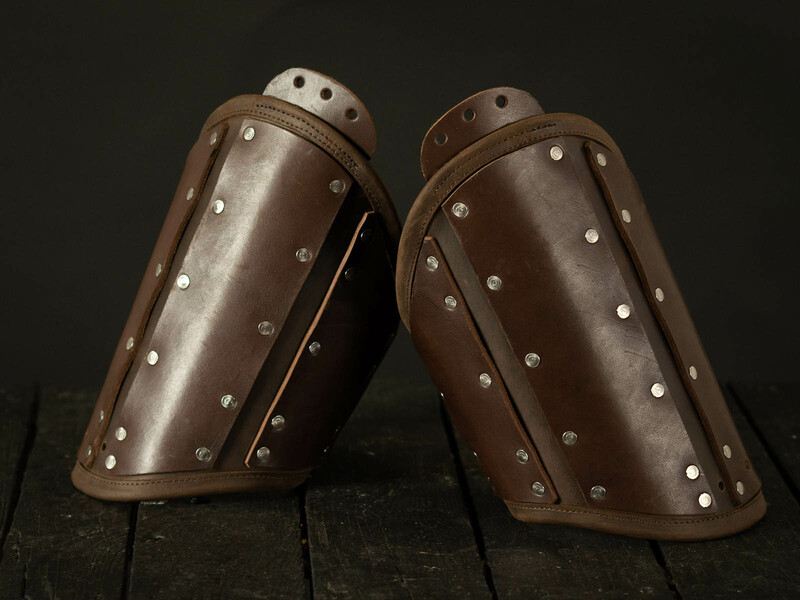 Well, these bracers are really cool, convincing example of functional leather armor. They may properly complete any fantasy-style costume of LARP armor. Or, they can become a base of unique battle look. Besides, there is not an accessory, but leather combat armour. 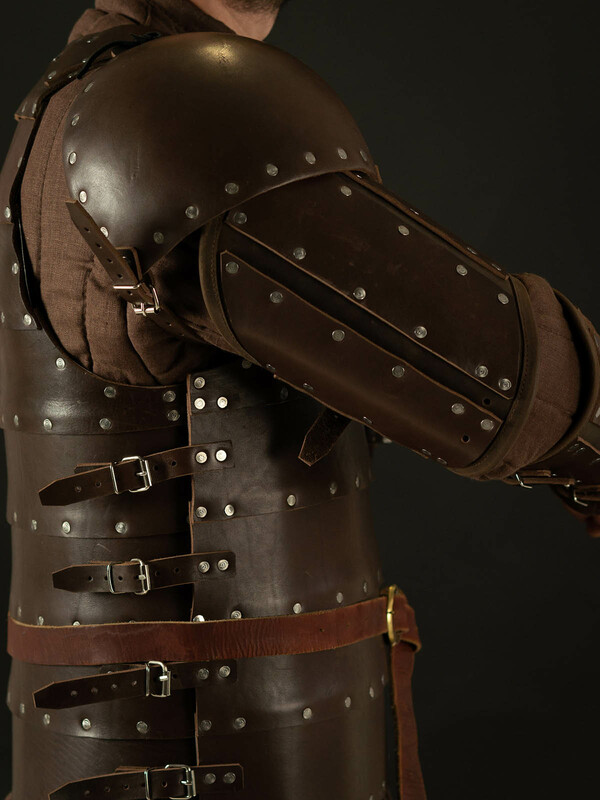 They protect arms well, very light and do not hinder movements during fencing. Especially, when your battle style is d.. 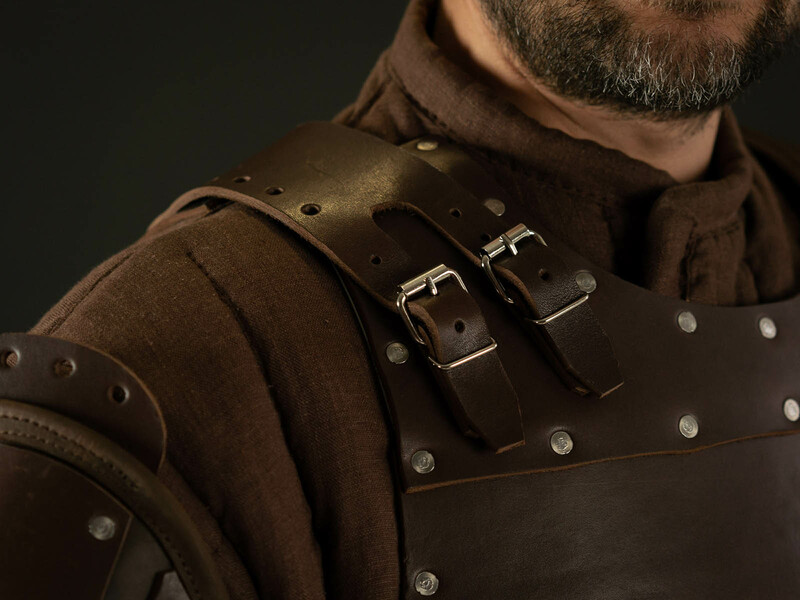 Whether you are crowned victor or going to a tournament for the first time, your armor will not get along without such important details as knight tabard. As it will not only prevent sunburn from heating of your armor, but also highlight your status. It is only your decision, what to depict on your coat of arms. We will only tell you what we can make. For example, this white tabard with elongated shoulder pieces and black festoons on the bottom hem. The black crowned eagle, which fills almost all body part, symbolizes immortality, braveness, insightfulness and might. Crown on his head highlight his status of “King of Sky” and Gods’ agent. On the back part and shoulders, there are his small, uncrowned copies; on the festoons – yellow flowers with fruits that emblematize abundance. Besides, there is coat of arms on the chest of the large eagle. It has scarlet field with white cross that is hinting on the belonging of men’s tabards owner to crusaders or some connection with Switzerland. In that..